I have very brittle nails, they are constantly breaking and chipping away. I read that Biotin can help with nail and hair growth so I decided to research it a bit more. I read all about it from multiple sources and decided it would be safe for me to take. I bought a bottle of Biotin and I started by taking half a pill, which would be 500mcg. A few days after starting Biotin my entire chin was covered in itsy bitsy tiny pimples. I was disgusted and it freaked me out. I couldn’t get rid of them and realized the only thing I had changed in my diet and routine was that I started taking Biotin. I remembered reading that one of the side effects of Biotin is breakouts. I guess that side effect is true to me. I decided to stop taking it. I researched a bit more and read that if I lower my dosage it may prevent the breakouts. I tried cutting the 1000mcg Biotin pill into three pieces. I took one of the pieces around noon and twelve hours later I noticed that my entire chin was broken out just like before. Tons of little tiny pimples that itch and burn. They feel and look totally different than any other breakout I’ve had before. I was really hoping that Biotin would help with my brittle nails but I will have to find another solution. 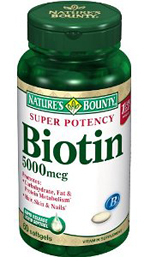 A lot of other people have had success with Biotin but I am not one of them. I can not stand to have my face look and feel the way Biotin made it. Do you have any recommendations for brittle, weak nails? Have you ever tried Biotin? What was your experience? Let me know in the comments below.